Pattern, 4" round pre-drilled base, beads & #3 round reed. 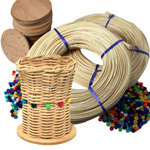 Wood bases makes it extremely easy for young people to learn weaving without having to weave a base. 4" diameter x 6" tall. Do you need a Kid's Kit for 20 kids? Got it! The Camp Kit. Need a Kid's Kit for 30 kits? Got it! The Classroom Kit . Click here for the Camp Kit for 20. Click here for the Classroom Kit for 30. I first discovered your kits when living in Dover, De and the DBA made baskets with kids on New Year's Eve. 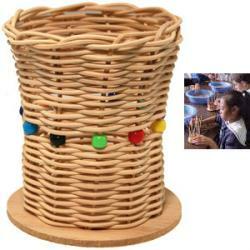 we used to make about 150 baskets with children.